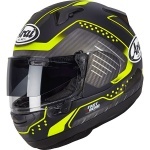 Top quality helmet at a very good price. Great service from Sportsbikeshop as usual. The quality of this lid is just superb both the finish and more importantly for a round skull like me the comfort levels excellent service from sportbikeshop as usual, thanks folks. Had to go up a size form my Signet Q but it's a perfect fit and very comfy. First ride was a round trip from Manc to Glasgow in the wind and rain and it performed as it should. Lighter than my previous helmet and seals better. I may actually take the chin part out as I couldn't stop my glasses misting but with the Pinlock the visor stayed fog free. Can't fault it and can't fault the Sportsbikeshop return policy when I chose the wrong size. Great price too! Very comfortable helmet. Only issue is the visor mechanism is trickier and more fickle than my Shoei, other then that great helmet. Nice replacement for my old Astro R. Look, feel and quality of a premium product. Nice new features with the visor mechanism. Good price and service from Sportsbikeshop. Visited store to try on a few other models then this was sent on as my size out of stock in two days well packaged for delivery. Great lid, feels premium but suppose it should for the price. Very comfortable with a good field of vision and gives good ventilation. Only gave 4 stars as feel there's a bit of wind noise on motorways but set of earplugs sort this. Service from Sportsbikeshop spot on as per usual, even did a price match for me. So pleased, have waited for a few months for this to come in, in my size XS.It is a true fit, very light and the vision through the visor aperture is much better than my old RX7. Lovely matt finish and the guys at Sportsbikeshop did a price match. Quality finish with top vision and fit. Well happy. 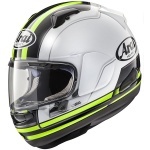 Classic Arai helmet that goes with any bike you ride.